Home / ACTION MOVIES / "Sicario" starring Emily Blunt, Josh Brolin, and Benicio del Toro Named "Best Opening Indie Film" in the U.S. for 2015! "Sicario" starring Emily Blunt, Josh Brolin, and Benicio del Toro Named "Best Opening Indie Film" in the U.S. for 2015! “Sicario” which means hitman in Mexico, brings Emily Blunt’s character, Kate Macer, an idealistic FBI agent, in the lawless border area stretching between the U.S. and Mexico who is enlisted by an elite government task force official, Matt Graver, played by Josh Brolin (an Academy Award® nominee) to aid in the escalating war against drugs. Led by Alejandro, an enigmatic consultant with a questionable past, played by Academy Award® winner Benicio Del Toro, the team sets out on a clandestine journey forcing Kate to question everything that she believes in order to survive. Even as Kate tries to convince herself she’s on a hunt for justice, she is thrust into the dark heart of a secret battleground that has swept up ruthless cartels, kill-crazy assassins, clandestine American spies and thousands of innocents. The jagged line of the U.S. and Mexican border is now awash in some of the most pressing questions of our times – drugs, terror, illegal immigration, corruption and an escalating swath of dark crime that has left people on both sides frightened and vigilant. “Sicario” explores the journey of an intelligence operation that pushes the rules to engage with those who don’t play by any. 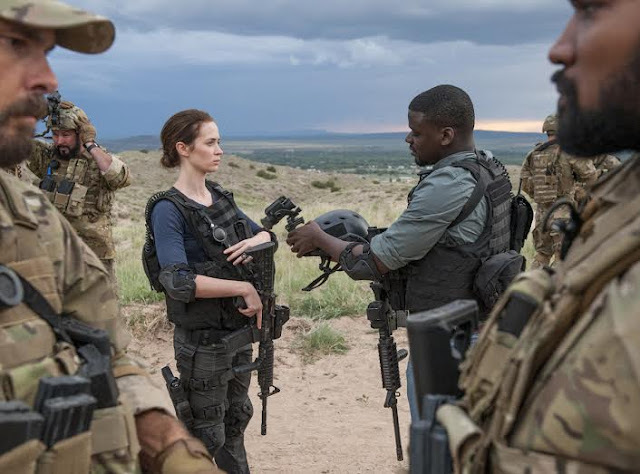 “Sicario is partly about a phantasm: the old idea that North America will be able to solve the most violent problems of the world in a very efficient and invisible way. That was once a comforting thought – but the world seems to have become more and more complicated.” says director Dennis Villeneuve, a four time winner of the Canadian Screen Awards for Best Director. Villeneuve is currently in pre-production on two additional projects “Story of Your” Life, starring Amy Adams, Jeremy Renner and Forest Whitaker and the Untitled Blade Runner Project, starring Harrison Ford and Ryan Gosling. He goes on: “We have a need for super heroes. However, in today’s reality, heroes don’t usually have clean hands. Heroes are in contact with the most difficult moral choices, the choices we must make when confronted by evil. Sicario’s moral choices fascinate me." “Sicario” opens on October 28, 2015 in Philippine cinemas nationwide to be released locally by Pioneer Films. Check out the movie’s latest movie trailer of "Sicario" movie below.